Store your belongings in fashion with this Hope and Love Personalized Breast Cancer Awareness Backpack. This Custom Printed Breast Cancer Bag is perfect for raising awareness of breast cancer and shows that you have hope for a cure. 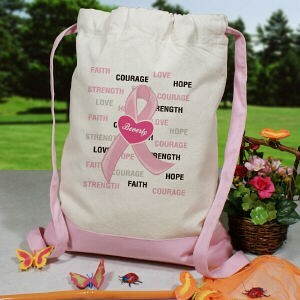 Use this large backpack at all your breast cancer awareness events. Your Custom Printed Breast Cancer Backpack is made of 12 oz. Canvas with a Cinch Closure. Measuring 14" x 18" x 2". Each Custom Backpack is made especially strong to hold your important essentials with a drawstring top closure. Personalized Backpacks include FREE personalization! Personalize our breast cancer awareness products with any name! I love the style of the bag. MyWalkGear.com has created a wonderful selection of Personalized Breast Cancer Awareness Gifts for people to help spread the word. Shop our Awareness Gifts today to help support Grandma, Mom, Sister or Best Friend.